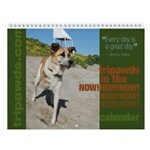 Save on Tripawd Gifts with 1-Day Sale! Today Only! You can save on three legged dog t-shirts and gifts in the Tripawds Gift Shop using the Cafe Press Shops Coupon code: TAPR1130 when placing your order. Sale is going on NOW and ends April 22, 2011 at 11:59 pm Pacific. With the Morris Animal Foundation Canine Cancer Walk coming up on Saturday May 7 in Northern California, now’s the time to show your team spirit with our New Team Tripawds Designs! Team Tripawds T-shirts and Jerseys are now available featuring the most popular three legged dog designs in the Tripawds Gift Shop! 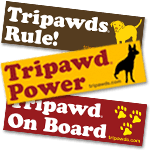 Remember, you can always check the Tripawds Gifts blog sidebar on the right for any Cafe Press coupon codes or promotions currently running. FTC Disclosure: Certain blog posts here may include sponsored content or affiliate links for which we have been compensated for. Partner companies include but may not be limited to Amazon, Blurb, TinyPrints and others. Bling! Bling! Last Day for Tripawds Pawliday Jewelry Orders is 12/12. Act Now to Save on Plush Replica of Your Tripawd! Tripawds Apparel and Gifts © 2019. All Rights Reserved. 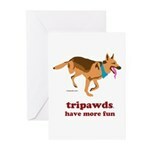 Tripawds Apparel and Gifts is brought to you by Tripawds.